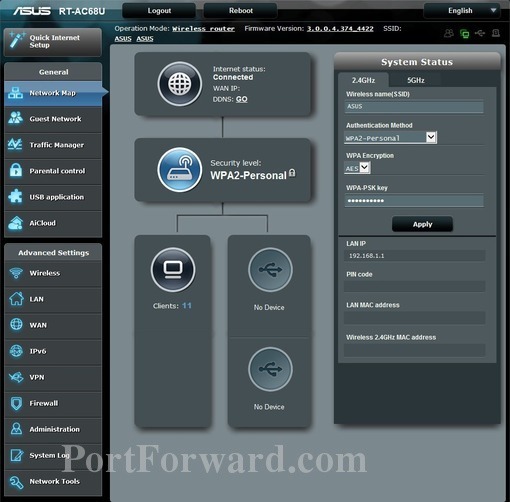 In this guide I will be showing you how to port forward the Asus RT-AC68U router. To understand what port forwarding is you need to first know that your router has a firewall. This firewall blocks most connections from the Internet to protect your home network from unwanted access from the Internet. Sometimes a game or application requires you to unblock some of these blocked connections. The process of opening a port or connection is called a port forward because you forward a port directly to a device on your home network. Setup a static IP address on the computer or device you want to forward a port to. Login to your Asus RT-AC68U router. Navigate to the port forwarding section of your router. Don't panic, scroll a little farther down this page and we will walk you though each of those 4 steps. Let's login to the Asus RT-AC68U router. Your router uses a web interface, meaning you need to login using a web browser. This can be done by using Chrome, Firefox, Internet Explorer or any other web browser you know of. It really shouldn't matter what browser you want to use. Do you see the address bar? It contains the numbers 192.168.1.1 in it. Just replace what is in the address bar with the IP Address of the Asus RT-AC68U router. Note: The router's IP Address is sometimes called the computer's default gateway. If you have changed the router's IP Address in the past and don't recall what you changed it to, we can help you find it. Learn how on the How to Find Your Router's IP Address page. You are on the right track if you see a box asking you for a username and password. Go ahead and enter the username and password and click the OK button to access your router's web interface. If you can't login to the router because the username and/or password are wrong then we recommend trying other Asus default usernames and passwords. Find our list of them on this Default Asus Router Passwords page. If you still can't login it might be that you have changed the username and password in the past and have forgotten. We recommend trying our Find Password App. It will help you crack a password on your home network. As a last option, if neither option above worked then it might be time to consider a router reset. This erases all personal data in your router and returns it to factory defaults. This should be used as a last resort. Learn how to do this in our How to Reset a Router guide. First, under the Advanced heading click the WAN button in the left sidebar. Now click the Virtual Server/Port Forwarding tab at the top of the page. Make sure that the Enable Port Forwarding Yes radio button is selected. Create a name for this forward and put it in the Service Name box. The name is only used as a reminder and has no effect on the port forward. If you are forwarding a range of ports, enter the port range into the Port Range box. The lowest port in the range should be entered first, then a dash, and then the highest port in the range. For example, you can enter 500-600 to forward all ports between 500 and 600. 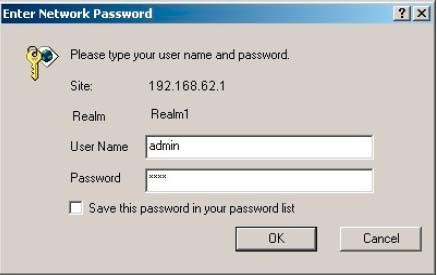 Enter the IP address that you want to forward these ports to into the Local IP box. Note that if you are forwarding ports so you can run a program on a device other than your computer then you can enter your device's IP address into that box instead. If you are forwarding a range of ports enter the port range into the Local Port box. The lowest port in the range should be entered first, then a dash, and then the highest port in the range. When you are completely finished click the Apply button at the bottom of the page to save your changes. 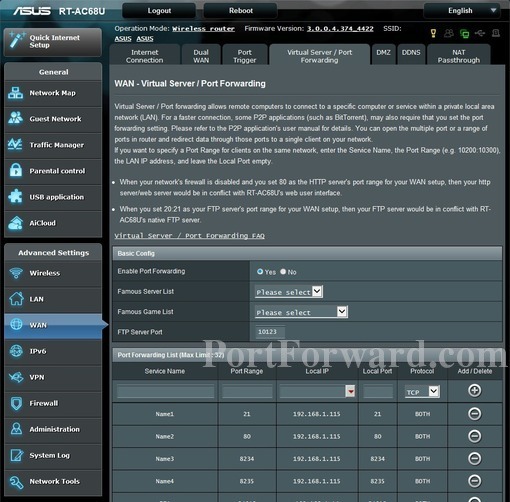 Now that you are finished forwarding ports on the Asus RT-AC68U router, how do you know they are forwarded correctly? One way to do this is download our Free Open Port Checker. It is part of our Network Utilities tool. Our Open Port Checker is the only one online that has Guaranteed Results. Learn more about this on our How To Check For Open Ports page. Here are some Alternatives to Port Forwarding. Check out more guides for your Asus RT-AC68U router.